Soon the government shutdown, like all government shutdowns, will end. I have to admit that I don’t really notice much difference when the government is open or closed. My life goes on pretty much as it always does. It is the same with my friends and family. I’m sure some out in America are affected by it. I just don’t personally know anyone who is. But, I’m figuring this whole shutdown idea is a real bad deal for the tax payers and not so bad a deal for federal workers, especially those who put some money put aside and are not living from paycheck to paycheck. 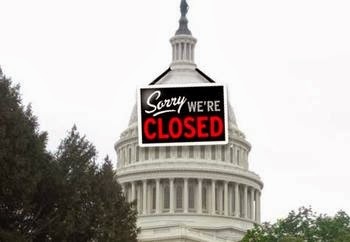 Nearly a million federal workers have been officially furloughed – they’ve been told to stay home except those few who may be needed in emergency situations. But, Congress has already passed legislation to pay all the government workers for their lost time as soon as the government re-opens. That means that the American people will be on the hook to pay for all the time these people didn’t work. The shutdown is really a paid vacation for federal employees, reimbursable when the vacation officially ends. So understand this – the government workers get paid for work they are told not to do. Is this what fiscal responsibility looks like? How much over time will be needed to get the government up and running once these people get back to their jobs? If the taxpayers have to pay these people their wages whether they work or not, I think it’s a good idea to send them back to their offices and posts ASAP.